It occurred to me the other day that the best boat gadgets we have on Hideaway are not actually marine specialty items. And it made me wonder what other handy tools and toys might be out there, lurking on boats or in backpacks, waiting for me to discover them. The boat business is kind of like the wedding business in that as soon as you add the word “marine” or “wedding” to words like “dishes” or “lighting,” the price triples. So, if I can find what I’m looking for in Walmart or online for a fraction of the “marine” price, I’m all over it. 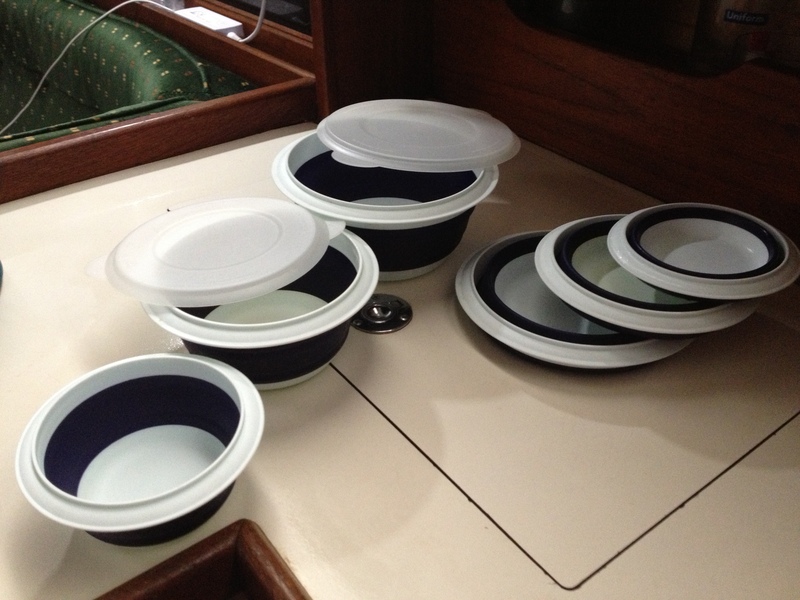 After all, plastic dishes are plastic dishes…they don’t need to be “marine” plastic dishes to be used on a boat! This one is at the top of my list right now because I’m cold. Simple as that. With temperatures getting down to the low thirties (Fahrenheit) at night, I’m ready to marry this thing, I’m so in love with it. It runs on camping stove propane, which is cheap and easy to find. It’s small and easy to stow. It heats up our entire 34′ boat. There’s no open flame, so I don’t have to worry about it catching the boat on fire. One can of propane lasts about 20 hours and costs about $2. Concerns? My father insisted we get a carbon monoxide detector for inside the boat because he was worried the propane fumes would kill us. The $30 detector we bought in Home Depot takes a digital reading of carbon monoxide levels, rather than just sound an alarm when levels are high. 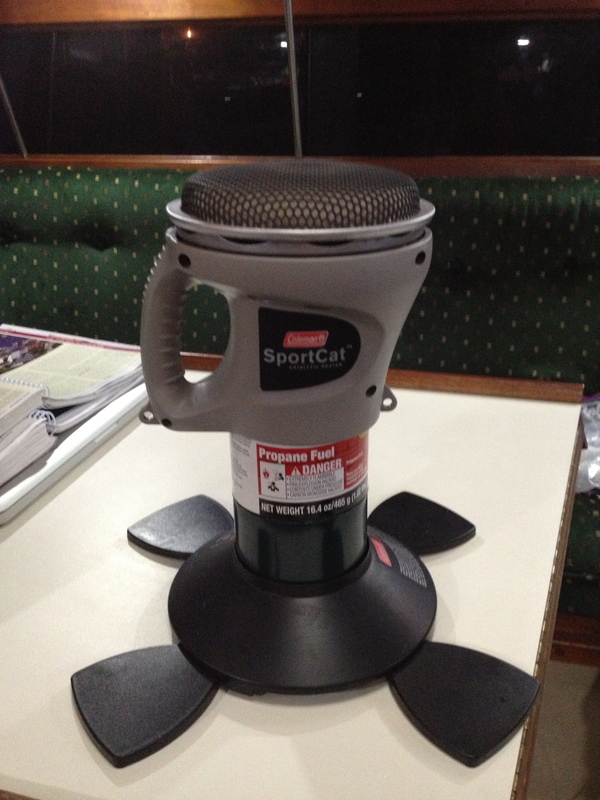 And so far it’s shown absolutely no traces of carbon monoxide in the air as a result of using our propane heater. Zilch. How much does it cost? $46.90 on Amazon.com. During our five freezing days on board in Hurricane Sandy, I would have paid double this price. 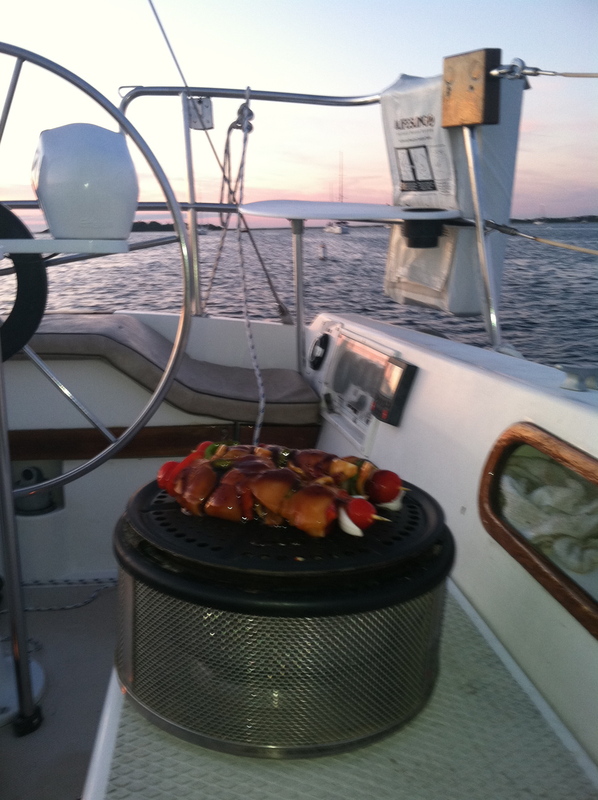 Designed for camping and BBQ picnics in the park, this grill uses charcoal rather than gas and can be placed anywhere on the boat – the cockpit, the cabin (though not recommended because of smoke), the deck, etc. It’s engineered to stay cool on the bottom and on all sides, apart from the lid. So, while the charcoal is burning, you can actually pick up the entire grill with your bare hands and not get burnt. Food tastes better when grilled on charcoal rather than gas (in my opinion). There are accessories for the grill, which allow you to steam food, make pizza and do other neat culinary things I have yet to try. All parts can be bought separately. So when you accidentally dump the charcoal rack in the ocean along with the charcoal (ahem…yes, that was me), you can buy the rack on its own, for a small price. How much does it cost? $139.21 on Amazon.com. Ryan is kind of a neat freak, so without this handy little tool, he would be a much more difficult person to live with. But with our Dyson, most of our messes can be cleaned up in a jiffy. Cat litter on the floor? No problem. Bread crumbs in the galley? No problem. Cat hair on the cushions? No problem. A lot of hand-held vacuums don’t have enough suction power to clean up a large mess. The Dyson does. We even vacuum our floor rugs with it. There are no vacuum bags to replace. You just empty the body of the vacuum and you’re good to go. It comes with different attachments, both long and short, so it’s very versatile. It even has a bendy attachment, so you can get into those hard-to-reach places, like the back corners of storage lockers. How much does it cost? Here’s the kicker – this one doesn’t fit into the “cheap non-marine” category, since it’s expensive at $329.00 on Amazon.com. 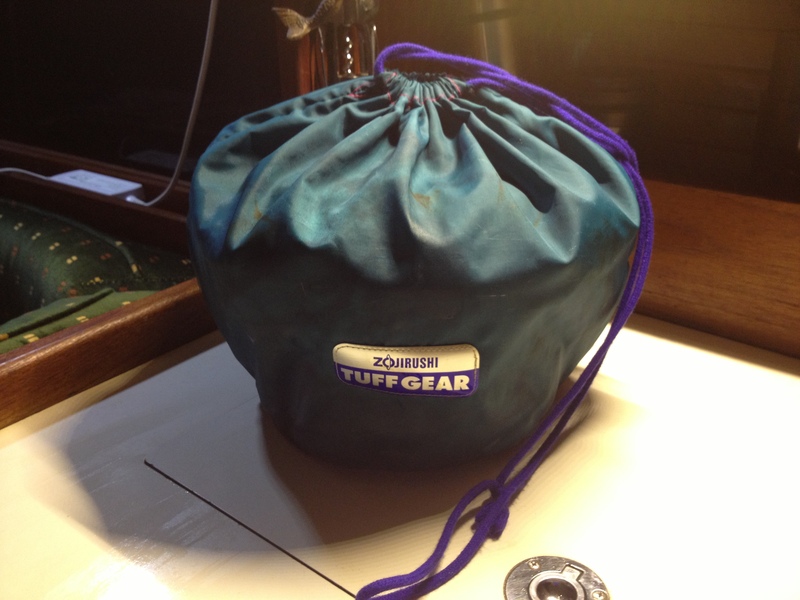 But it’s an item that never dies and has a 5-year warrantee (which we’ve never had to use). And if you’re at all OCD in the cleaning department, or you have a partner who is, this tool can be used to divert many a bad mood. Just sayin’. Ryan thought these were gimmicky and pointless when I first bought them, but in reality, we rarely use any of our other dishes now because these bowls are so great for everything: eating meals, feeding cats, storing leftovers (they have lids), prepping meals (which is actually what they were designed for) and serving snacks. Plus, they collapse down to the width of a plate, so they don’t take up much room, which is always a plus on any boat. How much do they cost? $14.88 on Amazon.com for a set of 3 (1 big, 1 medium, 1 small). They’re not as cheap as your run-of-the-mill plastic bowls, but they’re much more versatile and take up much less space. I bought this set of pots and pans in Russia over ten years ago, when I was living there teaching English as a Peace Corps volunteer, so I had these loooong before I ever stepped foot on a boat. But they’re the one item in my collection that I’ve kept through all my travels and would not dream of backpacking without. And now it turns out this little set is our main cookery set on the boat. Talk about long-lasting! I can’t find this exact make of camping pots online, which isn’t a surprise since I bought these in Nakhodka, Russia from a shop we volunteers used to call “the mafia store” because everything in it was so fancy and expensive that only the Russian mafia could afford it. I had coveted this set of pots for 2 years while I lived in Nakhodka, so when I was about to leave and go hiking through Siberia, I splurged and paid a whopping $100 for them. Bear in mind, I only got a $220-a-month stipend from the Peace Corps to live on, so this was a colossal splurge. And so worth it. 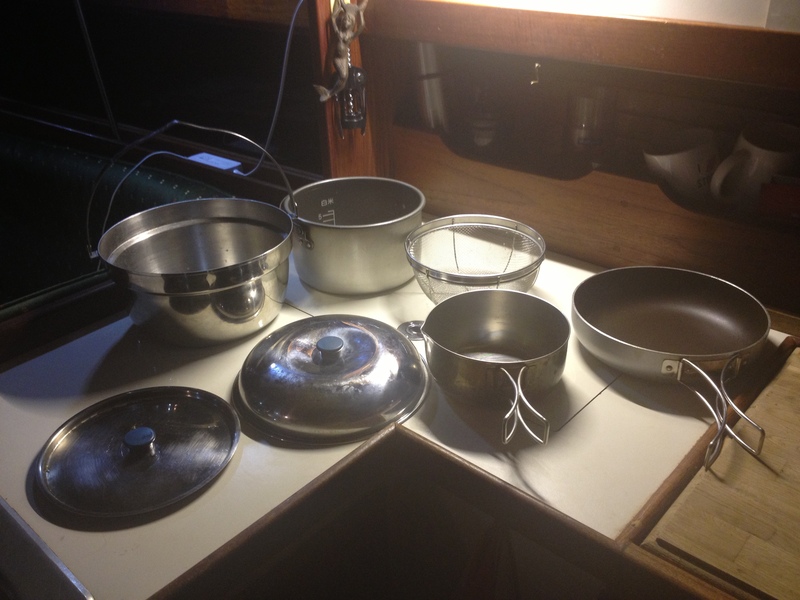 You get three different size pots (one of them a rice pot) with two different lids, a frying pan and a strainer. They’re lightweight and indestructible – these pots have been carried halfway around the world in a backpack, thrown into the backs of buses, bashed around a boat, and there’s not a single dent to show for it. 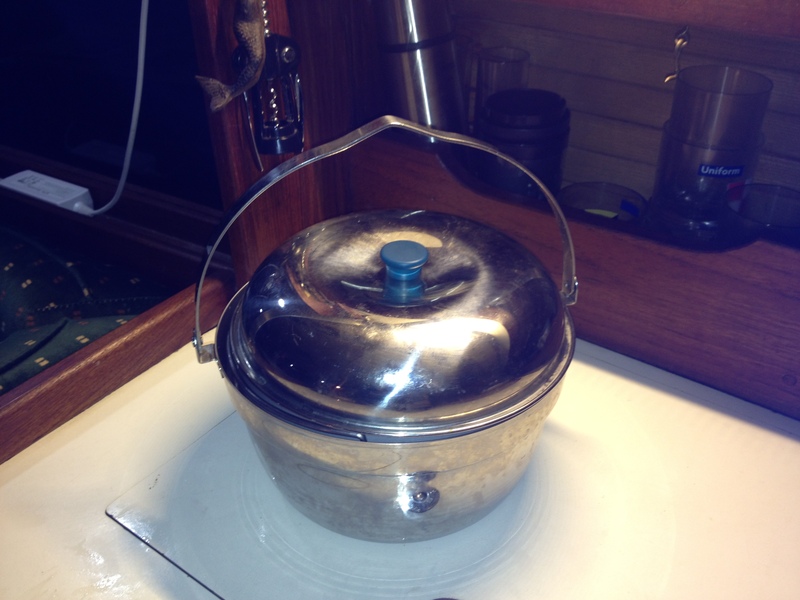 They pack up to the size of a single large pot, which saves a lot of space in our tiny galley. How much do they cost? Well, it depends on the quality of pots you go for. I couldn’t find this exact set, but I did find a similar, high quality set made by GSI on Amazon.com for $98.96. I also found a cheap set made by Texsport for only $20.58 on Amazon.com. What are your favorite items (on your boat, in your backpack, or in your suitcase)? 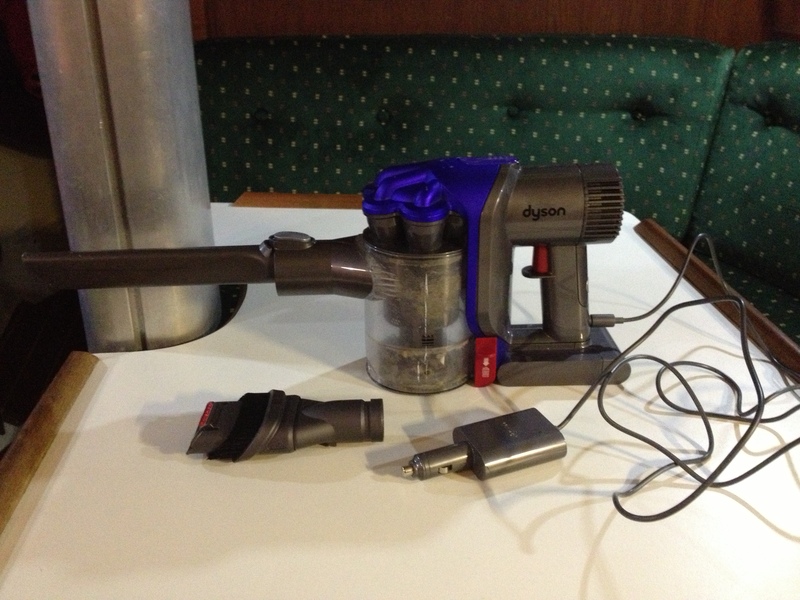 ummm… so i totally bought the dyson today because of this post. we have been researching vacuums for our boat and this did it for us 🙂 that and we got it free with out visa rewards points. thanks tasha! Wow, free! That’s GREAT! Glad to be of assistance! Please trade your favorite boat/camping things…always looking for a new idea! Hi Tasha, This is Kerri Brooks from f/b women who sail on MV Knot Yet. where are you now? Hi there! We’re on the ICW at about sm 662 in Georgia. We’re planning to anchor tonight and head for St. Mary’s tomorrow. Dang, we are a fair distance further south. We are right now in Cocoa Beach FL and heading to Vero Beach tomorrow. We are heading to Stuart FL for likely the better part of a month before we cross to the Bahamas. Love reading your blog :). Hopefully our paths will cross. We are hoping to be down that way soon! So I’m sure we’ll get to meet up…we’ll have quite a few chores to take care of in FL, as everyone does, I’m sure. Thank you for the compliments…keep in touch along the way! My love of stories drives me to write. My love of adrenalin drives me to chase adventures. These two things, stirred together, have cooked up this travel blog aimed at bringing you tales spun from dusty roads and unforgiving seas.